A hot housing market has developers of at least one already-approved apartment project in Glenwood Springs looking to more than double the number of units, and they might not even need a new fee waiver adopted by the city to do it. The Lofts at Red Mountain, which is part of the larger Glenwood Meadows development, is one of several projects approved or on the table in Glenwood that could take advantage of a new incentive program to waive certain impact fees in trade for some apartments being offered under a 30-year deed restriction to keep rents affordable to middle-income earners. But a proposal coming before the city to expand from two buildings and 88 apartments, as approved by the city in July 2015, to five buildings and up to 185 units, is being driven by the current housing market, he said. The proposal would serve to build out that portion of the residentially zoned sections of the Meadows. The Lofts, followed shortly by the 116-unit Oasis Creek Apartments on U.S. 6 that also won approval from the city in early 2016, served to spark conversation among city officials about how to provide incentives for developers of smaller residential units, especially rentals. When the Lofts project won the city’s approval, Leonoudakis and his business partner, Richard Myers, were quite vocal about the city’s impact fees for such things as water and sewer utilities, parkland dedication, emergency services and schools, being cost prohibitive. “We are not looking to avoid our fair share of impact fees, but without some relief from the current fee structure there is no way for us to help address the need for quality affordable housing in Glenwood Springs,” Leonoudakis wrote in a letter to City Council at the time. The concerns prompted the city to begin looking at ways to reduce some fees and to provide waivers for any developers who would agree to place deed restrictions on any rental units they proposed to build. Since then, the city did adjust its water and wastewater system impact fees to encourage construction of smaller units. More recently, City Council also approved a means for developers to qualify for fees to be waived altogether on units that carry a voluntary, 30-year deed restriction holding rents to a level that’s attainable for households earning below 120 percent of the Garfield County area median income. Tenants of those units must also be employed by a business with a physical address within Glenwood’s 81601 ZIP code, or have a home business that conforms with city guidelines. Tyler Richardson of Richmark Companies, developers of the Oasis Creek project, said his group is still working the numbers to see if it makes sense to proceed given current market demand. However, Richardson said the project is not likely to take advantage of the new fee-waiver incentives. “This is a market-rate project and was always intended to be that,” he said. Another developer who was floating preliminary plans for an apartment project on Midland Avenue, which was ultimately shot down by City Council, had an interesting take when asked if he would make use of the fee waiver incentives. Craig Helm said that, even though rental units in his project might fit the price points for deed restrictions, management of deed-restricted units is a concern. With a hot Dallas-Fort Worth real estate market under its belt, Stoneleigh Cos. LLC — the development firm behind the newly completed One Uptown in Dallas— has sold two of its apartment communities in Keller. The two communities, Dominion Town Center and Lakes of Stone Glen, were acquired four years ago in February 2013, with the principals of Stoneleigh Cos. being the original developers of the apartment communities. Both communities sold on Feb. 17. The 276-unit Dominion Town Center was sold with 96 percent occupancy rate, while the Lakes of Stone Glen, a 216-unit community, sold at a 99 percent occupancy rate. CBRE represented Stoneleigh in the deal. With all-time high occupancy rates and rental rates in North Texas, Stoneleigh, in partnership with Realty Capital Management, closed on a 4-acre tract at the northeast corner of Interstate 35 and Belt Line Road in Carrollton for a new apartment development. The 234-unit apartment project, known as Switchyard Apartments, will feature luxury studio, one- and two-bedroom apartment homes ranging from 525 square feet to 1,262 square feet with granite countertops, hardwood floors and stainless steel appliances. “Switchyard will be our latest new construction project in the Dallas area and will take advantage of the ongoing growth of the Carrollton market,” said Rick Cavenaugh, president of Stoneleigh Cos., last month. “Our enthusiasm for the project is buoyed with the excellent location and the current health of this Dallas submarket,” he added. Construction is slated to get underway by the end of this month. Upon completion of the Switchyard in 2018, Waterford Residential is expected to manage the property. Stoneleigh Cos. has opened One Uptown, a 20-story, 196-unit high-rise apartment building on McKinney Avenue in Uptown Dallas. With more than 18,835 square feet of retail space, the complex currently houses Brazilian steakhouse Fogo de Chao and will lease space to Circo, a five-star European restaurant, this summer. OneUptown’s amenities include a rooftop pool, private fitness studio, entertainment room, lounge, and a demonstration kitchen. Move-ins began on February 18. The doors have opened at Uptown’s newest high-rise apartment building, One Uptown, located on McKinney Avenue. The 20-story building features 196 residences ranging from studio apartments to penthouses and includes 18,835 square feet of retail and restaurant space. Fogo de Chão opened at One Uptown on February 13. A second restaurant offering, Circo, will join the building this summer as the restaurant’s first U.S. location. One Uptown’s walkability score stands out as the city’s highest, coming in at a 96, with Klyde Warren Park and Katy Trail available nearby. The apartment complex will also feature Uptown’s only rooftop pool, with a 9,000-square-foot sky deck and lounge. An expert jury will decide just how brilliant the electronic-dance music duo’s quick work is on Sunday night at the 59th Annual Grammy Awards, where The Chainsmokers are up for their first Grammy, for best new artist. Another upstart vying for the new artist title, Kanye-christened Chance the Rapper, completed most of his 14-track release “Coloring Book” in two months. If these guys can strike pop-music gold in less time than it takes most people to do their taxes, then imagine the benefit, if you’re so inclined, of having a recording studio at your disposal 24 hours a day. Luxury building developers, in the race to stand out from competitors, are hoping to capture a musical market by providing in-house music rooms and recording studios to accommodate artists hit by a spontaneous muse. In honor of the Grammy Awards, being held at the Staples Center in Los Angeles, here are a handful of residential developments equipped with musical amenities just one elevator trip away, and accessible day and night. As a rental development in Chicago’s northwest, these units are probably the most affordable on this list, running $4,000 per month for a two bedroom. The 13-story development is part of a larger Arlington Downs Development, slated to finish this year, which will include restaurants, retail and co-working spaces. 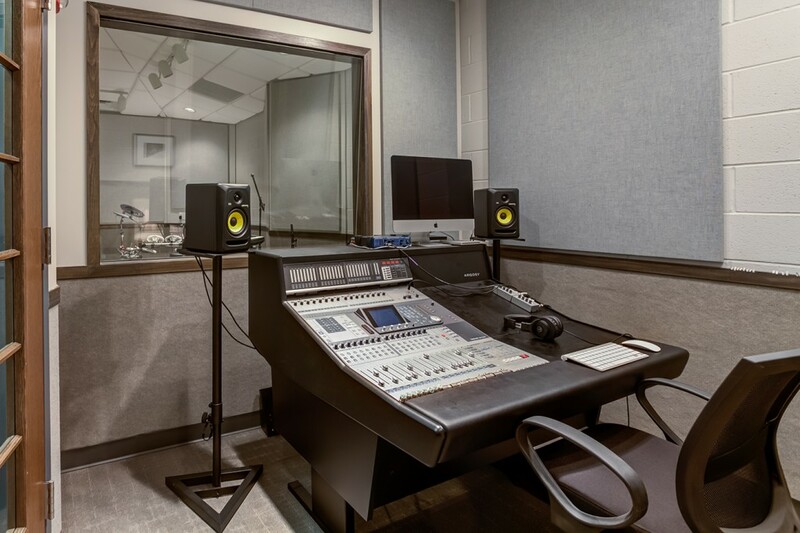 The former Sheraton and Hilton hotels site still hosts five-star services, including a modest in-house recording studio. The music room is part of what developer Rick Cavanaugh referred to as the basement “man cave,” which also includes a poker table, billiards, a shuffleboard and golf simulator. A curvaceous new Uptown apartment high-rise is almost ready for its first tenants. The 20-story One Uptown tower has been under construction on McKinney Avenue for more than two years. The $85 million project includes 198 luxury rental units and 18,000 square feet of restaurant and retail. More than 20 percent of the high-rise is already rented. Stoneleigh Cos. and USA Infrastructure Investments are the developers. The tower designed by Dallas architect Phil Shepard. The smallest studio apartment with about 540 square feet goes for around $1,650 a month. A 1,980 square-foot penthouse will run you just under $10,000. The top floor of the tower has a swimming pool and tenants lounge with sweeping views of Uptown and the Dallas skyline. On the second floor there’s another swimming pool with a clear glass bottom over the drive-up entry on Routh Street. Also on the second floor there’s a fitness center, guest rooms victors and a dog park. Six levels of underground parking serve the apartments and retail. Circo restaurant will open on the McKinney corner of the building this spring. Stoneleigh Cos. is rushing to finish the public areas in the building. Two large sculptures by artists Brad Oldham and Shane Pennington will be installed at the entry. “April 20th we are doing an unveiling of the sculpture,” Cavenaugh said. As Stoneleigh finishes up the Uptown tower, it’s moving ahead with a new apartment community near Main Street in Frisco. And the developer is about a week away from starting a transit oriented apartment project in downtown Carrollton. Stoneleigh Companies, LLC announces plans to acquire land to build The Lofts at Red Mountain Apartments, a new urban multi-family project, with a planned start in April of 2017 in Glenwood Springs, Colorado. (December 9, 2016) – Chicago-based Stoneleigh Companies, in partnership with Realty Capital Management, LLC, plan to build five, 4-story multi-family buildings adjacent to the Glenwood Meadows Market Street. The buildings will consist of 182 multi-family units, with garages, covered parking, a full amenity package with the latest residential designs to provide a complete rental living community for area residents. The multi-family units will range from approximately 508 square feet to 1,241 square feet and feature studio, one, two, and three bedroom units. The project will also include common area amenities and complementary commercial space on the ground level of the building fronting Market Street. The Master Development Application for Phase 1 of The Lofts at Red Mountain gained approval last winter. Realty Capital has been working with the City of Glenwood Springs to make the project financially viable through an in-depth analysis of City infrastructure and impact fees. “We are pleased to bring such a quality development partner on board for The Lofts at Red Mountain. Stoneleigh Companies has a long track record of success across the United States and understands the demand for quality housing on the western slope.” said Richard Myers, Managing Director of Realty Capital. The Lofts will bring an urban lifestyle to the Glenwood Springs community and will offer units and amenities that have not been available before now. The project is located in the Glenwood Meadows development, next to the Community Center, RFTA stop, and the Glenwood trail system. The Lofts will be a Class A apartment community with high-end finishes and common amenities. Amenities will consist of a state-of-the art clubroom, fitness center with yoga/TRX studio, business center, electric car charging stations, heated outdoor pool, outdoor kitchen/bar/grill pavilion with a fire pit. Each unit will include nine foot ceilings, wood flooring in entries and great rooms, stainless steel appliances, granite countertops, espresso shaker style cabinets, designer tile backsplashes, walk-in closets, full-size washer and dryers, and balconies with picturesque mountain and valley views. “The western slope market has been significantly underserved in new multi-family construction, and there exists a pent up demand for housing in Glenwood Springs. The Lofts will meet this demand while still remaining affordable to area residents. Stoneleigh has excelled at providing quality construction, delivering residents a very high level of service with a focus on creating living environments residents are proud to call home,” said Rick Cavenaugh. Based in Chicago, Stoneleigh Companies is a private real estate investment company focused on acquisition and development of multifamily properties, with a track record of over 40,000 multi-family units in 35 cities and 18 states over the last 33 years. The principals and officers of Stoneleigh are experienced in all aspects of commercial real estate development, finance, and operations and have been operating on a national platform since the early 1980’s. For more information, visit www.waterfordresidential.com. Realty Capital was founded in 1987 and over the past 29 years has developed over 3,500 residential units and more than one million square feet of commercial buildings. In 2011, Realty Capital became an employee-owned firm with Richard Myers, Jimmy Archie and Tim Coltart serving as Managing Directors. Realty Capital is currently partnered with industry leaders including Hillwood Communities, Stratford Land, Granite Land and Avanti Properties in development of multi-million dollar mixed-use projects across the Southwest. For more information, visit www.rcpinvestments.com. The only thing better than living in a swank apartment in the hottest part of Dallas is moving in right before the building becomes the new “it” locale. But how do you find that perfect urban homestead, before everyone else is clamoring to live there too? You talk to Dallas Apartment Locators, located above Mi Cocina in the West Village, who for eight years have been helping Dallasites and Texas transplants nail down their ideal new home, often with bonuses like free rent that otherwise might have gone unclaimed. These licensed Realtors take into account your preferences for area, budget, amenities, and timeline, and can find exactly what you’re looking for — all for free. The newest high-rise in Uptown has everything from studios to penthouses available in its distinctive 20 stories. City views, walkability, easy access to bars and restaurants, Whole Foods just down the street — the hashtag #OneUp says it all. It’s also home to a Dallas first: a glass-bottom pool, which complements the Sky Deck on the building’s rooftop. Two hospitality suites make hosting out-of-town guests a breeze, especially with the help of the 24-hour concierge. Located on McKinney Avenue in the heart of Uptown Dallas, the distinguishing curved glass architecture (created by famous Dallas architect, Phil Shepard) was artfully crated to embody the vivacious spirit of the neighborhood. Residents will enjoy an all-in-one, first-class living experience in a premier location that includes luxury amenities, modern floor plans and easy access to all the best parks, restaurants, nightlife and shopping Uptown has to offer. One Uptown also has the highest walkability score in the city, making it the perfect location for anyone seeking an active urban lifestyle. It is conveniently located next to Klyde Warren Park, the Katy Trail, Whole Foods, the newly expanded McKinney Trolley, and a high concentration of fine dining and nightlife hot spots in Dallas. “One Uptown offers comfortability, convenience and luxurious homes in one of Dallas’ most sought-after neighborhoods,” said CEO Rick Cavenaugh of Stoneleigh Companies, a national multi-family investor and development company. Developers have gotten the planning go-ahead to build a new transit-oriented development in downtown Carrollton. Stoneleigh Cos. — which is building one of Uptown Dallas’ new apartment towers — and Realty Capital will develop the four-story, 234-unit Switchyard apartment community on Broadway Street at College Avenue, just east of Interstate 35E. The planned rental project is across the street from the downtown Carrollton DART commuter rail station. And the site is at the crossroads with the planned Cotton Belt passenger rail line, which will run to Dallas Fort Worth International Airport. “We’re looking to break ground in February,” Stoneleigh CEO Rick Cavenaugh said. He said construction of the two buildings should take 16 to 18 months. Carrollton’s planning and zoning commission recently approved the development. EDI International is the architect for the project. Stoneleigh is just finishing its 20-story One Uptown apartment high-rise on McKinney Avenue in Uptown. And the developer has another new rental community in the works just north of Main Street in Frisco. Stoneleigh’s project will be the second urban rental community built at the downtown Carrollton DART station. Developer High Street Residential constructed the 311-unit Union at Carrollton Square starting in 2012. A sea of yellow and green — supporters of the Cotton Belt rail line in yellow and downtown subway in green — filled the Dallas Area Rapid Transit board meeting Tuesday night as officials finally voted on their 20-year financial plan that had left many wondering which long-term project the board would support. It was standing room only as the DART board voted 12-3 to fund both the Cotton Belt rail line and the subway version of a second downtown light rail, known as the D2 subway, as part of their 2017 20-year financial plan. The Cotton Belt has long been seen as providing a necessary east-west transit connection between northern suburbs, the airport and existing north-south rail lines that currently connect only in downtown Dallas. Recently it had been considered as part of DART’s 2035 financial plan, even though DART had promised an east-west corridor since its creation in 1983. DART officials expect to complete the projects in the next six years. Both projects would cost more than $1 billion each. The record rainfall that deluged Dallas in spring 2015 happened just as Stoneleigh Companies was digging a hole for its six-level parking garage in Uptown, and forced a five-month delay in the early days of construction for the new One Uptown tower at the corner of McKinney Avenue and Routh Street. Now, it’s a blessing in disguise, said Rick Cavenaugh, president of Stoneleigh Cos.
All around Uptown Dallas, new apartments were being built, occupancy rates were rising, demand was soaring and so were the rents. Uptown Dallas Inc. estimates there are 10,000 apartments in Uptown with an occupancy rate of 96 percent. Another 1,700 units are under construction now that will add another 2,500 residents by 2018. The population in Uptown has grown 55 percent in six years. And 45 percent of those residents are ages 25 to 34. With that picture in mind, Cavenaugh saw an opportunity to do an even more luxurious finish to in the 198-unit, 20-story tower. More wood floors, better cabinets and the latest closet organizers. “That helped us catch up to the market, so we started upgrading the building,” he said as he gave Crain’s Dallas a tour of the site. He’s watched the Uptown rental market evolve over the last few years from five to-seven-story apartment units to luxury towers that offer exclusive views of the city. As a result, One Uptown can now charge higher rents when it opens in early 2017. Residents will pay between $3 a square foot for the smallest studio units to $5 a square foot for the penthouse units that look southwest toward the downtown Dallas skyline. With the new Whole Foods on McKinney Avenue, tons of restaurants and sleek new offices, Uptown Dallas has become its own self-contained community, said Katy Slade, who chairs the Uptown Dallas Inc. board. The ability to live, work and play in a walkable area appeals to the younger demographic and empty nesters, she said. One Uptown will also feature a Fogo de Chao Brazilian Steakhouse and a Tuscan-inspired restaurant called Circo. Circo, expected to open this spring, will be a two-story restaurant with a glass-bottom swimming pool. Drivers who use the valet service on Routh Street will be able to look up and see the swimmers through the glass above. The restaurant will have a locker room where diners can change into their swimsuit. A spiral staircase will connect the first and second floors. Fogo de Chao will have outside dining and a circular skylight above the salad bar. The northwest corner of the building will feature LED lights that change colors, synced with the lighting at the Circo pool and the resident-only swimming pool and cabana on the 20th floor. The luxury finishes are just now being installed at One Uptown while other complexes, like the nearby Gables Park 17, already have residents in place. Instead of restaurants, the Gables has the Whole Foods grocery store on its ground floor. Competition between these complexes and a host of others will be fierce and will only increase as more are built. But Cavenaugh said he’s encouraged by the absorption rates in Uptown, Victory Park and the Knox-Henderson area. Nolan Marshall just moved his wife and one-year-old from New Orleans to Dallas a few weeks ago to take over as president and executive director of Uptown Dallas Inc. While people think of Uptown as being a millennial magnet full of young professionals, Marshall said he’s noticing more parents with young children like himself. “As young professionals age, we’ve seen a real ability for Uptown to retain that demographic once they start having children,” he said. That means planners need to change the way they look at Uptown Dallas infrastructure, including roads, schools and parks, he said. Uptown Dallas Inc. is leading an effort to transform all of McKinney and Cole avenues into two-way streets to slow down traffic. Currently, the eastern portions of McKinney Avenue are one way. They also want to keep the nearby urban oasis, Griggs Park, as a family-friendly park. AmerisourceBergen Specialty Group has decided to consolidate its North Texas workforce within a new $113 million, 40-acre campus in Carrollton, which will also make room for the company to add more than 1,000 employees. The Pennsylvania-based wholesale drug company had been looking for a new regional home for several months until it found a new home at the Offices at Austin Ranch at Parker Road and Plano Parkway in Carrollton. In all, AmerisourceBergen plans to add 1,039 new employees in the next decade, which highlights the company’s business growth, Andrea Roy, the economic development manager, told the Dallas Business Journal. “This will grow their workforce by a third,” Roy told me. “They will initially bring 1,184 employees to the new facility in 2019 with another 800 employees coming in a second wave in the next two to three years. “The remainder of those employees will be additional newhires over a 10-year period,” she added. Carrollton expects AmerisourceBergen will employ up to 3,023 workers and the city’s economic development group plans to offer the firm up to $1.9 million in grant money for the workers. The average annual salary is $72,000. Carrollton is also offering the company a 75 percent tax abatement on business personal property (expected to be $15 million) for 13 years. The city is also offering the developer, Billingsley Co., a 75 percent tax abatement on real property improvements (expected to be $113 million) for 13 years. AmerisourceBergen signed a 12.5-year lease with BillingsleyCo. for the 300,000-square-foot build-to-suit development. For the duration of the deal, Carrollton expects a net return-on-investment from the economic incentive deal totaling $4.8 million. “I think they really fell in love with the property,” Roy told me. “It’s a beautiful property with a park-like setting for a campus. They plan to enhance the lake and it has walking trails. “It’s also still close to everything and is somewhat affordable for their employees,” she added. AmerisourceBergen was not immediately available to comment further about the deal or the company’s growth. Gensler is the project architect. In a written statement, James Frary, an executive vice president of the company said, “As our business grows so do the needs of our associate population. 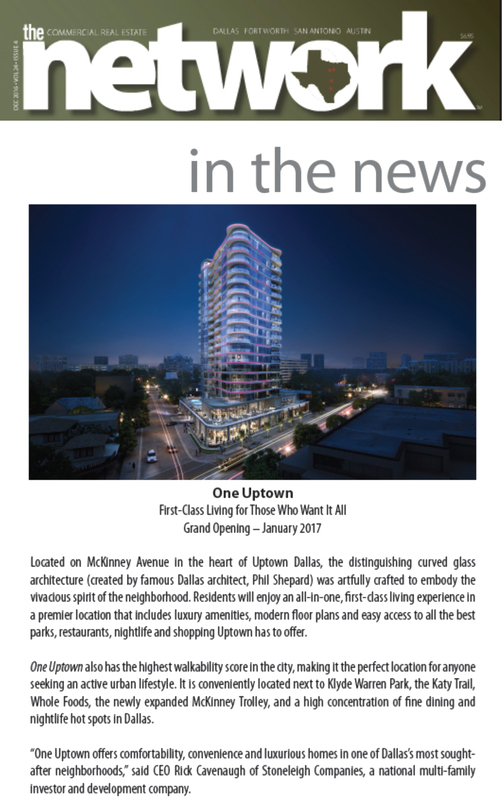 The luxurious lifestyles of Dallas’ Uptown residents will soon be complemented by One Uptown, a curved-glass, high-rise residential tower set to open on McKinney Avenue in January 2017. The 20-story building will include close to 200 modern residences with a slew of must-have amenities: private balconies, floor-to-ceiling glass windows, and state-of-the-art climate control systems, plus community amenities including a 9,000-square-foot deck and lounge, Uptown’s only rooftop pool, and a private fitness studio. Two new restaurants are also part of the chic complex — five-star European restaurant Circo (its first U.S. location), and internationally renowned steakhouse Fogo de Chão. One Uptown, 2619 McKinney Ave., 214.468.0001. Construction has begun on a new four-story apartment community in downtown Frisco. Stoneleigh Companies broke ground on Waterford at Frisco, a 381-unit apartment community that will be located off Main Street near Toyota Stadium. Waterford at Frisco will feature luxury apartment in two four-story wrap buildings, a private access parking garage and more than 9,000 square feet of retail and restaurant space. EDI Architecture is the project architect, and Aurora National Life Company is the construction lender. The Illinois-based developer behind Uptown’s luxury One Uptown residences on the former Hard Rock restaurant site plans to kick off a new luxury apartment community in Frisco, with ground-floor retail space. Stoneleigh Cos. plans to soon begin on the Waterford at Frisco, a four-story, 381-unit luxury apartment community along Main Street near Toyota Stadium. In all, the two-building wrap buildings will add more than 9,000 square feet of retail and restaurant space. The lifestyle benefits from the site’s proximity to Toyota Stadium, Frisco Square, The Star in Frisco and Legacy West was the driver behind the firm deciding to build urban-style apartments in this North Texas suburb, said Rick Cavenaugh, president of Stoneleigh Cos.
“The community will offer the best units, finishes and amenities for the discerning Frisco resident,” he said, in a statement. The Waterford at Frisco is part of a larger growth strategy for Stoneleigh Cos., which plans on building 1,430 apartments in North Texas in the next few years. EDI Architecture is the project architect for the community. Stoneleigh Construction Company, an affiliated firm to the developer, is the general contractor. Aurora National Life Co. is the construction lender on the project. Waterford Residential was named the community’s property manager. Plans for the community include fitness centers with private workout studios, community lounges, two courtyard pools, game rooms and outdoor pavilions. A developer that’s building one of Uptown Dallas’ new residential towers has started work on a project in Frisco. Stoneleigh Cos. has broken ground on Waterford at Frisco, a 381-unit apartment community north of Main Street market near Toyota Stadium. The 4-story rental community will include 9,000 square feet of retail and restaurant space. The project has community lounges, fitness centers with private workout studios, game and activity rooms, two courtyard pools and outdoor TV and grilling pavilions. EDI Architecture designed the project and Stoneleigh Construction Co. is the general contractor. Aurora National Life Co. is the construction lender. Stoneleigh in Dallas is building the 20-story One Uptown apartment tower on McKinney Avenue. The 198-unit luxury rental project will open in January.